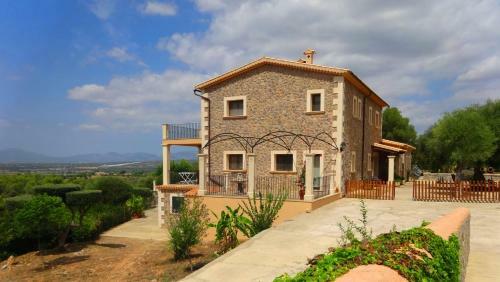 S'Alqueria de Son Gual in L'aranjassa is a holiday home with 1 room. 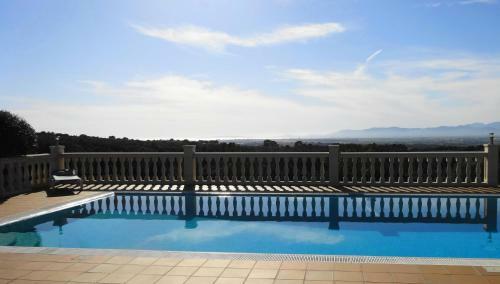 Featuring a private outdoor swimming pool, S'Alqueria de Son Gual is located in La Aranjasa. 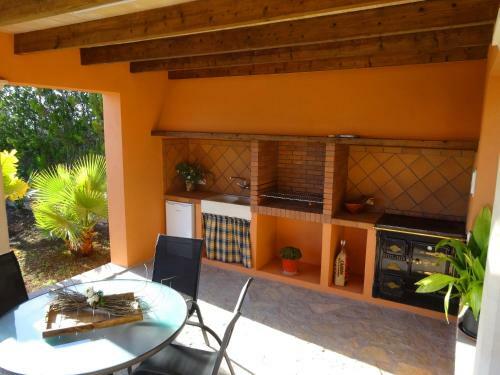 This holiday home offers free WiFi and a covered terrace with outdoor furniture. This air-conditioned house has 3 double bedrooms, 1 twin bedroom, and 3 bathrooms with a bath or shower. Bed linen and towels are provided, while a washer and dryer are available. There is a spacious living area with a fireplace, sofa set, flat-screen TV with DVD player, and dining table. The kitchen is equipped with a dishw...asher, oven, toaster, fridge, and coffee machine. There is an outdoor dining table on the terrace, and sun loungers are located around the pool. You can reach Las Maravillas Beach within a 20-minute drive of S'Alqueria de Son Gual. 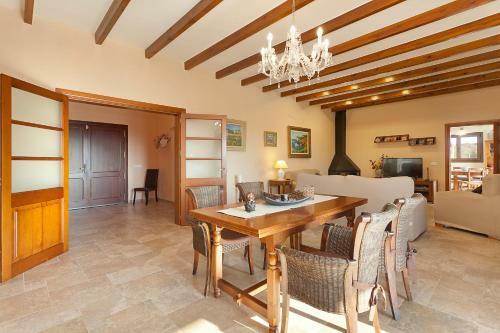 The city of Palma is 19 km from the property. 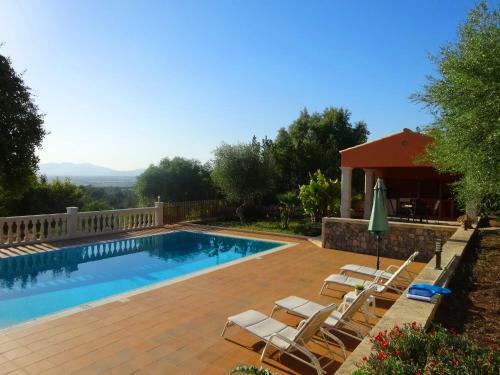 Featuring a private outdoor swimming pool, S'Alqueria de Son Gual is located in La Aranjasa. 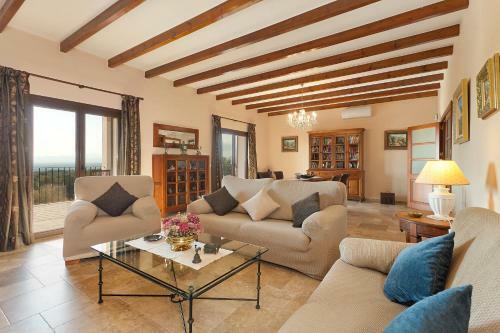 This holiday home offers free WiFi and a covered terrace ...with outdoor furniture. This air-conditioned house has 3 double bedrooms, 1 twin bedroom, and 3 bathrooms with a bath or shower. Bed linen and towels are provided, while a washer and dryer are available. There is a spacious living area with a fireplace, sofa set, flat-screen TV with DVD player, and dining table. The kitchen is equipped with a dishwasher, oven, toaster, fridge, and coffee machine. There is an outdoor dining table on the terrace, and sun loungers are located around the pool. You can reach Las Maravillas Beach within a 20-minute drive of S'Alqueria de Son Gual. 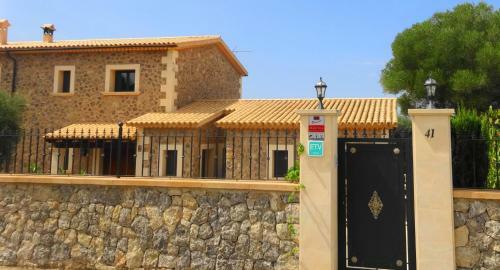 The city of Palma is 19 km from the property. When would you like to stay at S'Alqueria de Son Gual? Children and extra beds All children under 2 years stay free of charge for children's cots/cribs. All children under 16 years are charged EUR 15 per night for extra beds. All further older children or adults are charged EUR 15 per night for extra beds. The maximum number of extra beds in a room is 2. Supplements are not calculated automatically in the total costs and will have to be paid for separately when checking out. Any type of extra bed or child's cot/crib is upon request and needs to be confirmed by the innkeeper. Payment before arrival via bank transfer is required. The property will contact you after you book to provide instructions. Please inform S'Alqueria de Son Gual in advance of your expected arrival time. You can use the Special Requests box when booking, or contact the property directly with the contact details provided in your confirmation. This property will not accommodate hen, stag or similar parties. A damage deposit of EUR 300 is required on arrival. This will be collected as a cash payment. You should be reimbursed on check-out. Your deposit will be refunded in full in cash, subject to an inspection of the property. Parties are not permitted in the house.